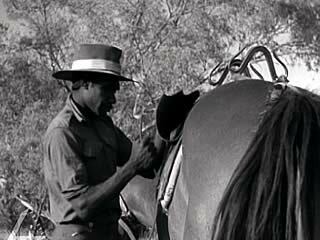 Video clip synopsis – In the remote outback, a policeman sets out with two Indigenous stockmen to inspect the many hundreds of kilometres he patrols. His duties cover everything from punishing lawbreakers to acting as postmaster. Broadband MP4 outback_bb.mp4 (5.7MB), suitable for iPods and computer downloads. An Outback Policeman’s Life is an excerpt from the film Outback Patrol (20 mins), produced in 1952. Outback Patrol: This film, narrated by Chips Rafferty, follows the annual patrol of outback policeman Robert Darkin. If there is a spot of lawbreaking, Darkin can convene a court but in this job he’s also collector of public monies and protector of Aborigines, Commonwealth electoral returning officer, commissioner for affadavits for the Supreme Court, postmaster, inspector of stock, and registrar of births, deaths, marriages, mines, motor vehicles and dogs. He checks that there is water in the government bores for the drovers and keeps an eye on the lone prospectors who roam the trackless hills and parched plains. Other horse and camel teams, operating from scattered police stations, patrolled the whole Northern Territory. Outback Patrol is a National Film Board Production. Produced by the Department of the Interior. H.3 A student demonstrates understanding of cultural reference in texts. H.4 A student uses language relevant to the study of English. H.8 A student adapts a variety of textual forms to different purposes, audiences and contexts, in all modes. In remote areas of Australia police periodically need to go on long patrols to come into contact with remote communities and to be seen to be implementing the rule of law. The list of policing and civic duties in earlier times was extensive including delivering the mail to convening a bush court. The remote far northern region of Australia is a vast area to cover and the policeman would often head off on horseback for three months at a time with the assistance of an Aboriginal stockman or two. These days, there are more roads and police patrols can be more easily carried out by four- wheel drive. In some remote regions, alcohol and substance abuse are becoming serious problems in communities, with Indigenous Australians being particularly vulnerable. List at least six of the jobs done by outback police identified in the video clip. List the personal qualities and physical skills the policeman demonstrates. Briefly describe what you think are the best and worst aspects of this job. The video clip was made more than fifty years ago. In small groups, discuss and write answers to the following questions. What is the message(s) about the role of an outback policeman in the video clip? What visual images does the filmmaker use to get these message(s) across to the viewer? What problems are identified in the video clip as being problems found in the outback? What images are shown of Indigenous Australians? Are these images positive or negative? Give reasons. Construct a careers information brochure or poster about becoming an Outback policeman for people in the 1950s. You must use at least two visual images and 300 words of text. Include the following headings; qualities needed, job description, what you can expect. (Remember to use bullet points, clear font, numbers and arrows if necessary). Write captions for any visual images used.